Aspiration by Grant Stinnett… The world of “Solo” bass has become an interesting and most assuredly challenging arena. 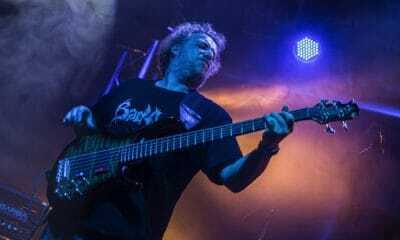 The effort to redefine the traditional role of the bass in a solo atmosphere has reached new heights with the likes of Michael Marring, Victor Wooten, and Steve Bailey to name just a few. In all honesty, I’ve also heard a few efforts wondering, what was the point to this recording, which lends to that crowd in the community that feels bass should remain “bass”. For myself, I’m in total disagreement with that take, and I know I’m not alone out there. This is far from being just “my” opinion, but bass is simply another voice in our musical language that can be spoken in whatever context the artist deems fit to use….end of story. That being said, Grant Stinnett’s new release Aspiration, is a welcome addition to this relatively new movement of solo bass artists. He presents a nice array of techno-adventures, ambient excursions, chord/melody playing, tapping in the Manring/Wooten style, and quite honestly a few good melodies that stuck with me. It’s quite an undertaking trying to take bass to that next exalted level, and thinking about that, I find that I’m in agreement with what I would consider Mike Pope’s position on this to be, that being, the electric bass and what we’ve done with it is still in its infant stages. A great job by Grant on this effort to make some headway on that precipice.